Metal mace heads were being used, prior to 1000 AD, in the formerly Persian areas of Islamic rule, in the Byzantine Empire and in the southern Russian and Ukrainian steppes and northern Caucasus. Bronze was as popular as iron or more so in these areas. 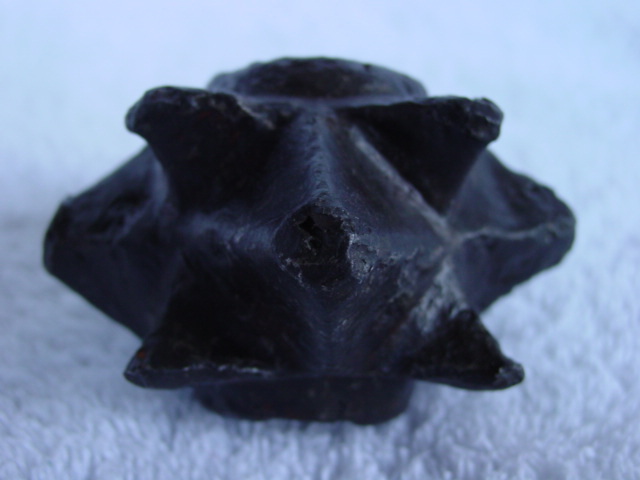 However, as mace use spread into eastern, northern and southern Europe iron became more and more popular. The earliest known maces from this era are all knobbed. Flanged maces do not seem to be as old and are certainly rare until around the 13th century. Knobbed maces come in several styles although many, including some from western Europe, trace their routes to the knobbed cube form found in the Khazar lands north of the Caucasus in the 9th and 10th centuries. A beautifully made but very small version of the earliest type of medieval knobbed mace. This design - four pyramidal knobs on a cubic body - is known as Type I in Kirpichnikov�s typology of Russian and Steppe mace heads. These maces are first found in Khazaria, the steppe lands just north of the Caucasus mountains, in the 9th century AD. By the 11th century they were being made in Kiev and other southern Rus cities. These maces were spread westward into the Balkans by the migrating western Turkic tribes. 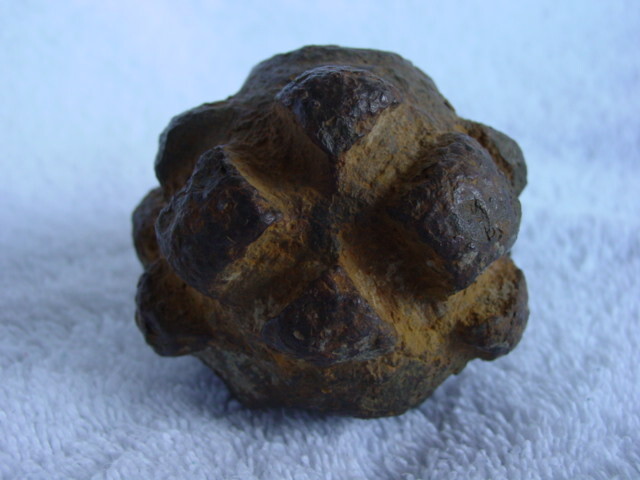 Iron mace heads are found in the Balkans, likely of local tribal manufacture. Higher quality bronze examples come from the Kievan and Khazar foundries. The mace is 5.35 cm wide and 2.65 cm tall. The haft hole is 2.2 cm in diameter. The mace only weighs 0.09 kg (0.2 lbs). Nevertheless, the haft hole is as large as those of much bigger mace heads. This is likely not a miniature offertory mace head as these were usually smaller scale models and would have had a much smaller haft hole. Ths mace head was clearly meant to be placed on a full-sized haft. Although light, it is hard and pointy and would make an adequate secondary weapon against an unarmoured or lightly armoured foe. An overhead view showing the large haft hole and the four knobs. Sorry for the fuzzy photos. I will re-post better ones soon. This mace is of a form found across Russia, Ukraine, Moldova, Romania, Hungary, Bulgaria and the former Yugoslavia. Known as the Kirpichnikov Type IV, it originated in Kievan metal foundries and was based on a local adaptation of the Khazar mace type shown above - the Kirpichnikov Type I. The four upper and four lower corners of the Type I�s cube have extended outwards forming smaller knobs giving the Type IV twelve knobs (four large and eight small). These maces were first produced, mostly in bronze, in Kiev and other southern Rus cities. 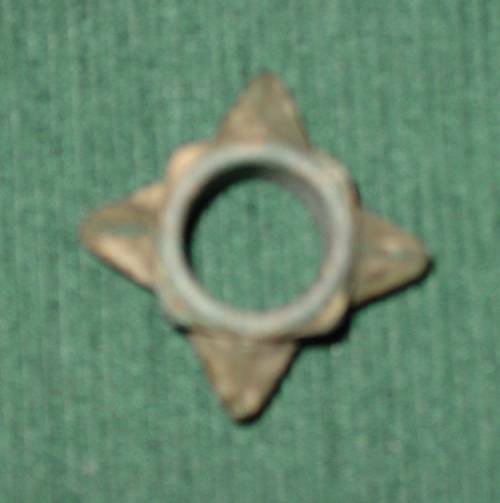 Many existing Kievan bronze examples are highly decorated with rings, lines and dots. Bronze maces were first exported and later copied (in both bronze and iron) throughout much of Europe. Examples are known from the Baltics, Hungary, Romania, Bulgaria, the Western Balkans, Germany, Sweden and England. These maces are heavy and deadly and would be effective against not only against unarmoured or lightly armoured foes but against any armour of the time (c. 1100-1300). The Turkic peoples of this time usually wore lamellar armour of leather, horn, bronze or iron. This mace is 8.2cm in diameter and 4cm high. The hole is 2.75cm in diameter. It has 12 pyramidal knobs in three rows of four - four four-sided knobs and eight three-sided knobs (half knobs). It is hollow cast and is roughly 3mm thick at the edges. The knobs are solid. It is 0.39kg (0.85 lbs). It is made of iron. The mace has seen heavy use. 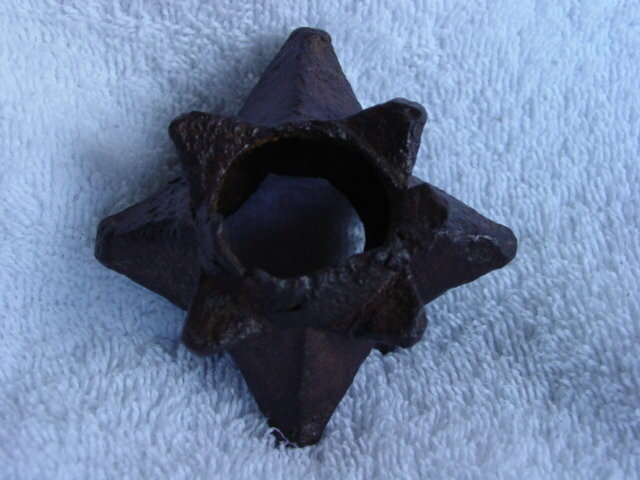 Top view of the same mace head showing the star pattern of the "standard Kievan knobbed mace". This mace is of the same form as the previous but is reported to be from Kent in England. While this at first appears surprising and hard to believe there are other fully documented finds of similar mace heads from England. 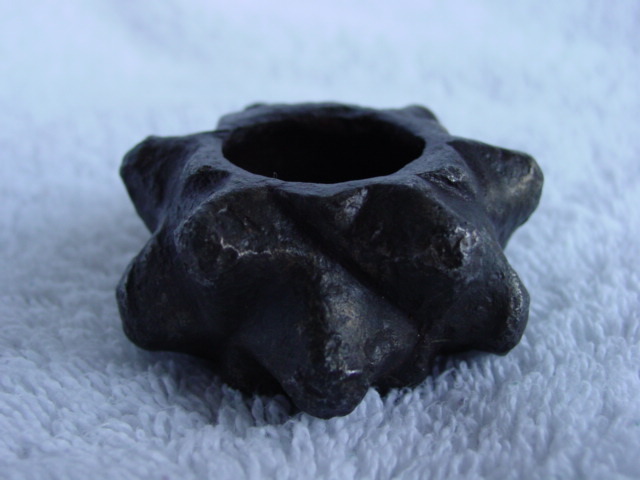 A knobbed mace head of almost identical form, but made of bronze like many Eastern European examples, was found in the cesspit of Dryslwyn Castle in Wales and is believed to date from the 1287 siege of that castle. The Dryslwyn Castle mace has an eight-sided metal neck, extending several inches below the head. The mace illustrated here has significant damage to its top and bottom and could have once been attached to a similar neck. Either way, the similarity in head shapes is uncanny. 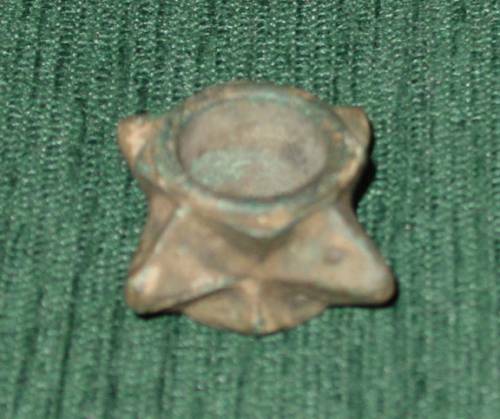 Another, similar mace, also with a metal shaft, was recently found in Kent. The style spread from Kiev westwards through the Carpathians, northwards along Scandinavian trade routes and southwest into the Balkans. The few examples from England and Western Europe likely came via Scandinavia but could have come from other routes. This mace is 8.25cm in diameter and 4cm high. The hole is 3.1cm in diameter. It has 12 pyramidal knobs in the same pattern as the previous mace although the main four knobs are slightly longer. It is hollow cast and is roughly 3mm thick at the edges. The knobs are solid. It is 0.26kg (0.55 lbs). It is made of iron. 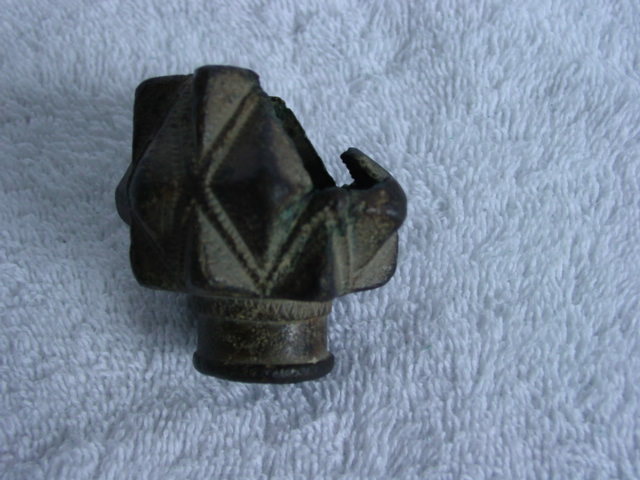 Top view of the same mace head. The main four knobs are clearly much longer than the smaller half-knobs. 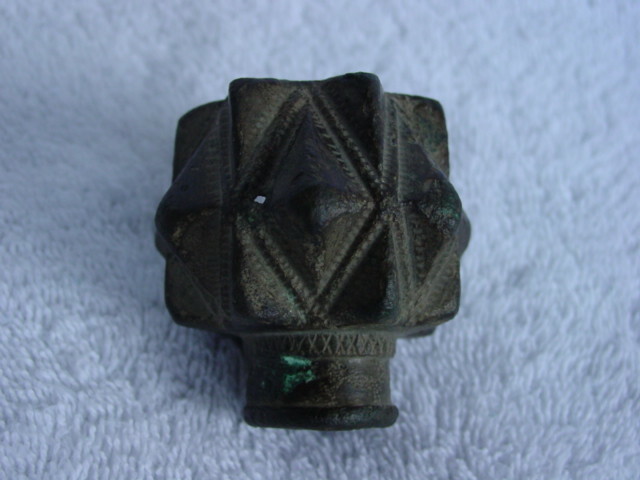 This small mace head comes from Hungary or its environs. 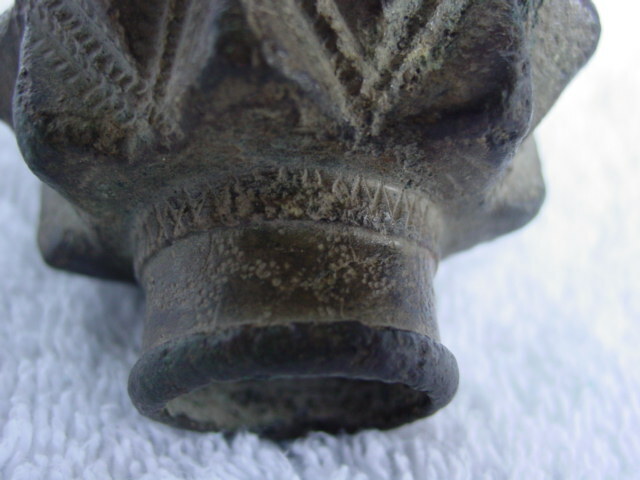 I have found no exact parallel to this style although it is obviously a variation of the Kievan style of knobbed mace head seen above. The bronze construction and high quality imply that it could be an import from the Kiev area. 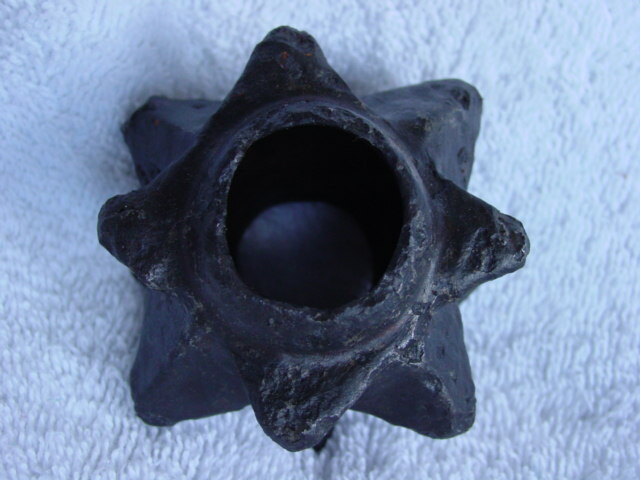 This small mace is 6cm in diameter and 2.9cm high. The hole is 2.6cm in diameter. It has 12 pyramidal knobs in two rows of six. It is hollow cast and is roughly 3mm thick at the edges. The knobs are not hollow. It is only 0.16kg (0.35 lbs). It is made of bronze. 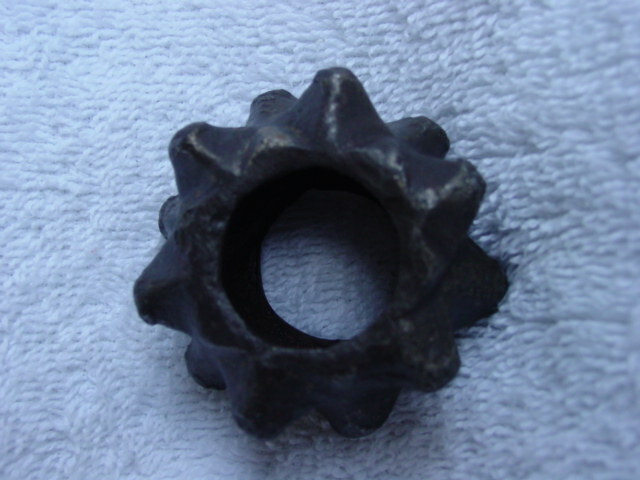 Top view of the same mace head showwing the two off-set rows of six knobs each. The haft hole is quite large for the size of the mace. The high quality of design and construction is evident. 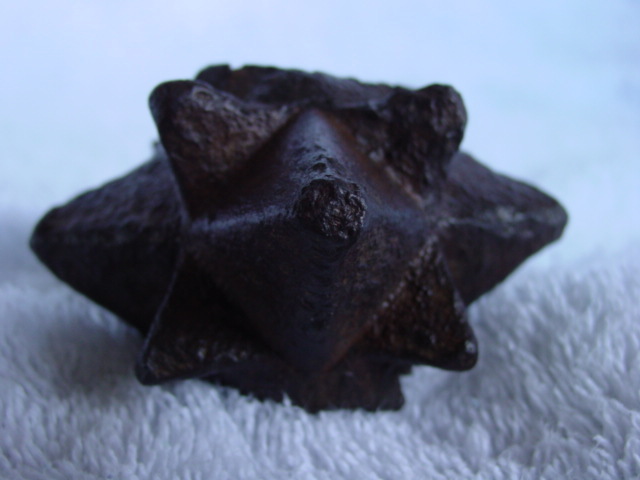 This extremely well made, but damaged, mace head is a later and more refined variation of the standard knobbed mace pattern. Maces identical in overall form have been found in Hungary, Bosnia and Croatia. 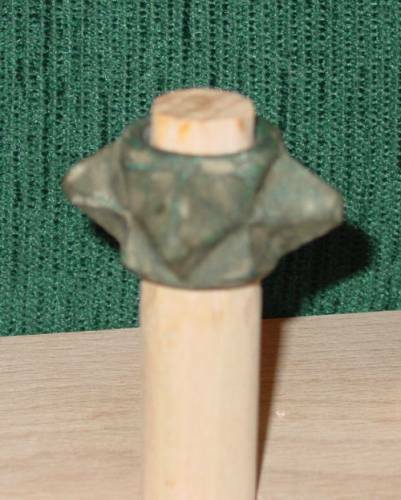 Various styles of knobbed maces have been found with similar, but not identical decorations. They come from Moldova and Eastern Hungary and Romania. On the bulk of the evidence the basic design is likely Kievan inspired, a variation on Kirpichnikov's Types I and IV. While the pseudo-kufic design (see below) seems to indicate Arab influence, the Cumans/Kipchaks used the Arabic script for their Turkic language. This mace likely comes from Cumans/Kipchaks, former steppe dwellers who had, by this time, settled on the Hungarian plains. Although, it may have been made for them in a foreign foundry - such as at Kiev. This mace is 5.8cm in diameter and 5.2cm high. The hole is 2.2cm (bottom) and 2.8cm (top) in diameter. It has 21 low knobs in three rows of seven - 7 diamond-shaped and 14 triangular (half-knobs). It is hollow cast and is roughly 2mm thick at the edges. The knobs are hollow but thicker than 2mm. The head has been heavily damaged. Approximately one-third of the upper half of the head has been broken away - likely in combat use since the edges near the hole are bent inwards showing signs of a major impact. What is left of the head is 0.15kg (0.33 lbs). It is made of bronze and is highly decorated with incised markings. A side view of the mace showing the damage and the hollow construction. A close up of the mace showing the decoration. There are small pointed ridges in the gaps between the knobs. There are parallel lines incised along the two sides of these ridges and an equal way up the two sides of the adjacent knobs. The ring immediately below the mace head proper is inscribed with a diamond cross-hatching design. Finally, the broad part of the neck is inscribed with a pattern of tiny dots in what appears to be a neo-kufic pattern. That these dots are not the result of corrosion is shown by the fact that they extend all the way around the neck despite changes in patina type. The wavy up and down pattern of the dots appears to be an attempt to mimic Arabic/Persian script. This mace, found in the Balkans, is likely derived from the Kievan style. The placement and shape of the knobs is almost the exact same as in the Kirpichnikov Type IV mace shown above - one row of five (instead of four) diamond kobs and and two off-set rows totalling ten (instead of eight) triangular-base half-knobs. However, the knobs are flat unlike the proper Type IV tall pyramidal knobs. This similarity implies close knowledge of the Type IV mace - which is not hard to imagine as it spread far and wide. In addition, round mace heads with many flat roundish knobs are illustrated in a Milanese carving of 1167, a Navarresse manuscript of 1197 and a late 12th century Swabian/Swiss painting. While the painting shows a Magi in Eastern costume, the Milanese carving shows an Italian militiaman so it can be assumed that Europeans used this design by at least the late 12th century. Unfortunately, none of these iconographic examples is detailed enough to know if these 12th century southern European maces had the same pattern of knob placement. There are also literary refences to an 11th century Persian mace style known as Bilka Takini (literally �grape stones�) could be similar to this form. This large, heavy mace is 7cm in diameter and 6.0cm high. The hole is 2.85cm (bottom) and 2.6cm (top) in diameter. It has 15 flattened knobs - 5 are diamond shaped and 10 are triangular (half-knobs). It is hollow cast and is roughly 3-4mm thick at the edges. The knobs are not hollow. It is 0.41kg (0.90 lbs). It is made of iron. 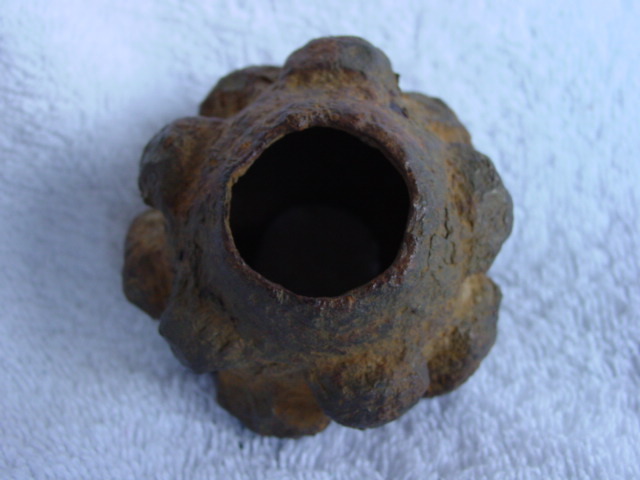 Top view of the same mace head showing the large haft hole.